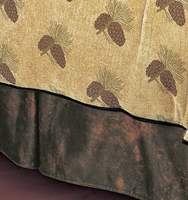 Bring the great outdoors into your rustic bedroom with the Pinecone Chenille collection! It's lavishly embellished with trims, fringes, and faux-leather microfiber. You'll be surrounded in style and luxurious comfort with rich brown maple leaves, pinecones and pine needles. Each seven piece set includes pinecone chenille comforter, two 21x27" maple leaf/faux leather shams, two 16x21" fringed pillows, one 8x21" maple leaf neckroll pillow, and an 18" deep faux-leather bedskirt. NOTE: Twin set includes one sham and one rect. pillow. Maple Leaf euro shams sold separately. Follow manufacturers care instructions.